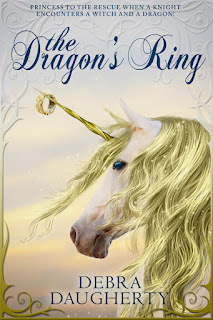 Today, I want to welcome Debra Daugherty with her new release, The Dragon's Ring. Look at the absolutely stunning cover! A loud, deafening roar pierced his eardrums, and he felt the ground beneath him shake. James whirled around and found himself face to face with the most ferocious creature he had ever seen. 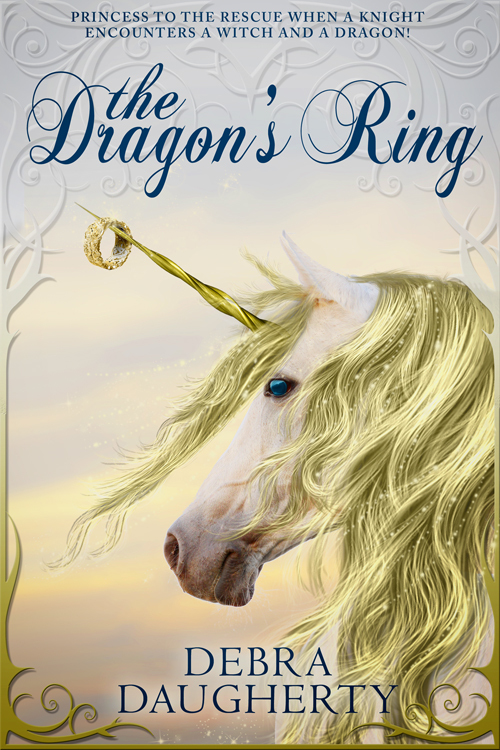 He had never encountered a dragon before, but he had heard all the stories about them from other knights at the castle. Nothing he had been told prepared him for this sight. An enormous and fierce green dragon with thick, scaly skin glared at him. The dragon, at least twenty feet tall, swished its long tail back and forth, and each time the tail hit the wall of the cave, the room shook. James noticed that the tail ended in a sharp point, just like a spear. The dragon roared again, and flames spewed from its mouth, while huge puffs of smoke seeped out of its nostrils. When the dragon opened its mouth, James saw that its teeth were sharp and jagged. His legs trembled. He could hear his knees as they knocked together, and for a moment he thought he was going to faint. As the dragon inched closer, James took a step back and then moved to the left. The dragon did the same. He dashed to the right and so did the dragon. James decided to run and hide from the dragon until he could devise a plan on how to defeat it. He ran as hard and as fast as he could, but the dragon was right on his heels. Deeper and deeper into the cavern James went until he could go no further. He had reached a dead end. There were no more tunnels to explore, and the dragon was blocking his only way out. James was trapped and the dragon knew it. 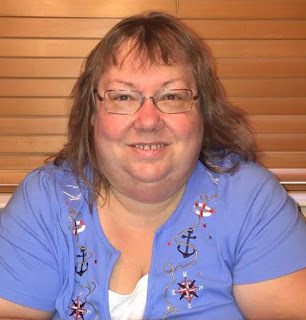 Debra Daugherty is from Central Illinois and is a member of SCBWI, Society of Children’s Book Writers and Illustrators. She enjoys living in the country with her two dogs, a Chihuahua named CeCe, and a rescued American Stratford Terrier named Honey. Besides writing children stories, Debra loves to spend time with her family, travel, and browse through antique shops. Publishing credits include CALAMITY CAT, Houghton Mifflin Harcourt, at www.CuriousWorld.com. She’s also had two short stories published in Guardian Angel Kids’e-zine, LET YOUR IMAGINATION SOAR! and THE MYSTERY OF THE GHOSTLY THIEF. In 2015 her children’s story, HEART OF STONE, won first place in the Litchfield Student Education Foundation’s writing contest. Thanks, Kathy. I appreciate your doing this post. Superb job.